In This Edition: Yesterday The “Used By” Window The Inspector Edit Without Fear When and Where? 11 November 2011 —It wasn’t long after we published yesterday’s edition of The Latest Word that the pent-up anxiety of Helix users around the world exploded. The world had changed and things would never be the same again. The very thing we predicted had come to pass. Unfortunately, and upon reflection, we are only too well aware of our contribution to the collective angst, not so much by what we said, as by what we didn’t say. Our excitement at nearing the completion of the AppleScript phase of the Europa project overwhelmed our sense of balance, and we left out virtually any mention of good news for the Helix users who are hanging on, waiting for the graphic interface to return. We completely understand the fundamental problem. After all, the graphical user interface is what drove us to Helix as well. We just didn’t want our user base to ever be stuck without a way to work in Helix and this was the fastest way to assure that. So, we apologize to anyone who read yesterday’s edition of The Latest Word and felt we were lecturing to them. You’re right. There are plenty of great things to learn in this world besides AppleScript. We apologize to anyone who read yesterday’s edition of The Latest Word and thought we were saying that there would not be a graphical user interface in Helix RADE for macOS. In spite of every way we try to say it, someone always interprets the message as a veiled way of saying there will never be a graphical user interface. What else can we say? It just isn’t true. The graphical user interface for Helix will shortly be all we have left to finish. Finally, we apologize for doing such a bad job of conveying the reality of the situation, and we offer this edition of The Latest Word as a token of our appreciation to everyone who has hung with us through this arduous process. But the communications that we have received since then — along with a search of our web site — have opened our eyes to the fact that we have never properly illustrated what is so great about macOS RADE. So let’s slow down, gather our wits, and actually explain what is happening with the graphic interface in macOS RADE. Some of this will ‘steal the thunder’ of future announcements, but you deserve this information now. The Used By window was briefly mentioned in the Release Notes for Europa 6.2 PR 2 on July 10. 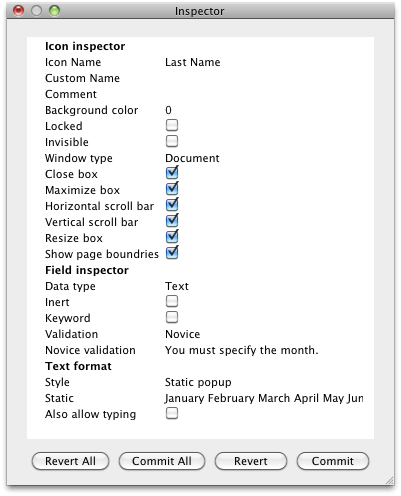 The Used By window replaces the Classic Get Info window, but it improves on it in many ways. The image on the right shows two ‘Used By’ windows open. The first improvement you will notice is that this new window is completely resizable. The complaints about the old Get Info window being too small are over. The second thing is that in addition to showing the icons’ kind and name, it shows its parent (where it is found) and content (summary information) as well as the usage — a message about how it is used by the icon. Right now, this column mostly reports obscure link messages that exist in Classic RADE, but virtually nobody knows about because they were only available through a Why? dialog that you could get to only by double clicking an icon from within a Get Info window. In macOS, they do not require arcane knowledge or extra steps to see. And when we turn our full attention to the graphic interface, the usage messages can be expanded. Likewise the Inspector has barely been mentioned at all. We mentioned it all the way back in the December 2009 edition of The Latest Word, but since then, nothing more than a few scant mentions in the Europa Release Notes. The first thing we need to say is that the Inspector is still a work-in-progress, although it is already showing its promise in streamlining the workflow. The window is a bit rough at this point, because we did it as a quick job just to prove that the concept was solid. Once we knew it would work, we set it aside until the AppleScript work was complete. With that phase nearing the end, you can expect to see much more from the Inspector very soon. Select one or more icons, then choose Show Inspector from the Icon menu. (Keyboard shortcut: Command-I) When the Inspector is open, the menu item changes to Hide Inspector and the same keyboard shortcut closes it. In Classic RADE, there is only one type of icon that you can work on without having your changes applied immediately: the template. With templates, you can edit them all you wish, and the changes are kept until you either close the template, or choose ‘Save’ from the ‘Icon’ menu. If you don’t like those changes, choose ‘Revert’ and the template returns to its pre-edited layout. But for every other icon type, the changes you make are applied immediately, with no option to undo the change. Ever try to edit an abacus that is used in various places? If you’re not extremely careful, you can cause the abacus to become ‘invalid’ and when you do, other icons that rely on the type of it staying the same become invalid as well. When this happens, Classic Helix beeps at you and gives you a Why? message that is maddening in its vagueness, reporting simply that the icon has been removed from a number of places. If you weren’t thinking ahead, you are left with no clue as to which icons (or how many) were changed. We solved that problem by applying the concept of “save and revert” to all icon types. In macOS we call this committing and reverting changes. In the graphic interface, you will be able to edit any type of icon, and as many icons as you wish, without committing a single change to the collection until you are ready. At the bottom of the Inspector window are four buttons: Commit & Commit All, Revert & Revert All. These buttons give you the control whereby you ‘commit’ your changes to the icon(s) you’ve modified, or ‘revert’ to the previous design. Naturally, the buttons ending with “All” apply to every change made since the last commit. You can get a taste of this now, because the Inspector currently works with field icons. Open your collection, find a field that is used extensively, double click it, and start changing settings. Switch its type from Text to Number; Remove the validation; Make it Inert… after you’ve completely rendered it unrecognizable to the function for which it was intended, at the point where all hope would be lost in Classic RADE, click the Revert button — your field is restored to its former glory. As soon as the AppleScript phase is complete, we will turn our attention fully to the graphic interface. The first phase will be more icons that can be edited via the Inspector. Complex icons (such as the abacus) will require something more, but there will be an interface. But you shouldn’t expect Helix to look like Classic Helix anymore, and we do not want to bring forward all of the things people rightly complain about in Classic RADE. We can do better. The truth, ultimately, is that we can’t know how long RADE will take. We only know that we will never get there if we don’t keep pressing forward. Much work still lies ahead of us, but at last we’re in sight of the place we have fought for nine years to reach. And we invited you to help us reach that destination. We understand that not everybody wants to take that risk, and we accept that, but if you’ve chosen to wait, you must accept that you will pay a higher price for the upgrade when it arrives, and that we will not be able to reach that goal as quickly as we could have if we had your support. Many Helix users who had no intention of ever learning AppleScript have stepped up and supported us. That support has gotten us six months of nearly un-throttled progress. In that six months we have nearly completed the AppleScript code — ahead of our projections — and fully expect to start releasing graphic editors in a very short time. It would be terrible — but not the end of the world — if we had to slow our engineers down because we can’t pay them to work full time. As we’ve said many times before, there is no wealthy financier backing Helix anymore. This is a cooperative effort, and we move forward only as fast as you allow us to.